A couple of days ago I made a skirt and a few people have asked for a how-to. The tutorial for me was this brilliant tutorial from Rachel which takes you through measuring yourself and drafting a proper pattern. If you want to do it properly, that's where to go. If you want to make a quick and slapdash skirt, here's what I did and bear in mind I am not a dressmaker and none of this is the proper way to make clothes, but it's quick and easy. There's no dress pattern, no serging, no lining and you cut with a rotary cutter. It's a quilter's skirt. This one is made from Chicopee cord from Village Haberdashery. 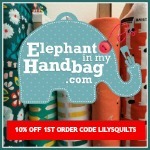 3/4 yd/metre fabric such as linen, cord or home dec IF your hips are max 40". Over 40", you need one and a half yds / metres. One 9" / 20cm (or thereabouts) ideally invisible zip (zipper) but any old zip will do. 1. Before cutting anything, you are going to press the hem and waistband of the skirt. The skirt will be in three pieces: front and two halves of the back. If you're using 3/4yd, you do this step once. If 1 1/2 yds, you do it twice after first cutting the fabric into two lengths of 3/4yd. This one is made from Echino Buck linen from Sew Fresh Fabrics. 2. Looking at the pattern on your fabric (if it's large scale / directional etc), measure where your waistband (top of the skirt) and hem (bottom of the skirt) will be. My skirts are 18" long. So fold up and press the top and the bottom of the fabric so that you have a strip in the middle as wide as the length of your skirt. Trim the top spare fabric to 4" and the hem spare fabric to about 2-3" (you will later trim the hem to 1" but 2-3" gives you leeway if you think the final skirt is too short!). 3. Now you are going to press an additional fold in the waistband by folding and pressing an inch under so you have a 3" waistband with 1" folded and pressed under. 4. Now you need to rotary cut the front and back panels of your skirt and you will do this with the folds in place. You need to cut one width for the front which is half the hip measurement plus 1" and two widths for the back which are a quarter of the hip measurement plus 1". Cut right through the folded layers. Here's some Echino I have on order for my next skirt (from eternal maker). 5. Next you need to cut the taper at the waist. 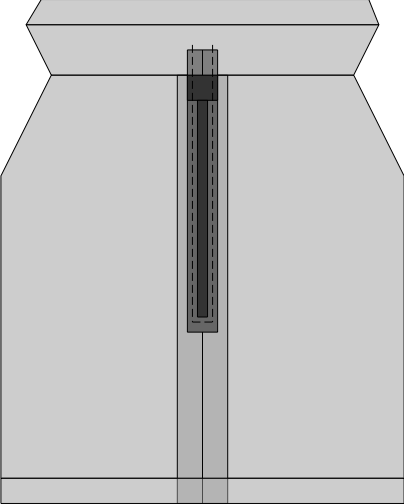 On both sides of the front panel and on one side of each of the back panels (one on the left, one on the right), rotary cut a taper as shown in the diagram. It will be as long as the distance between waist and hips and as wide as a quarter of the difference between hips and waist. So if your hips are 40" and your waist is 32", it will be 8" divided by 4 so 2" wide. Again, you are cutting through folds of fabric at the hem and waistband. The diagram shows the cuts I make for my skirt. 6. Now to sew the centre back seam with zip. Lay the zip along the edge of one of the back sections (the straight not tapered side). Align the top of the zip with the top of the skirt (i.e. aligned with the fold in the fabric). Mark on the back of the skirt the place where the zip comes to. NB: Mark where the plasticky bit of the zip ends, not where the flappy bits end. 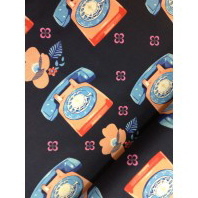 Another skirt is going to be made from these Melody Miller telephones (also from eternal maker). 7. Unfold the folds, pin and sew your back seam starting at the hem. You'll be sewing a 1/2" seam. Backstitch to start and sew using about a 2 to 2.5 stitch. Sew to the zip mark. At that point go backwards and forwards a few times. Then carry on up to the top of the skirt now using the longest stitch on your machine. Do not backstitch at this end. Press seam open. 8. Now you are going to sew the zip in place. Lay it so the front of the zip faces the back of the middle back seam. Align the top of the zip teeth with the fold at the top of the skirt. Either using a zipper foot or a regular foot with your needle zinked over to the right, sew the zip onto the back of the skirt. You're back on a 2 to 2.5 stitch here. Starting at the top of the flappy bits of the zip, sew down, turn and sew a few stitches just beyond the plastic teeth of the zip and back up the other side all the way off the top of the zip (see diagram below). Backstitch at the beginning and end if you like. I don't bother. 9. Now unpick the top part of the seam over the zip and stop and trim threads when you get to the bit where you went forwards and backwards a few times. 10. Now pin and sew the side seams. Again, these will be sewn with the pressed folds unfolded so you'll kind of zig and zag up by the waistband. Again a 1/2" seam, stitch length 2 to 2.5 and backstitch at each end. When you get to the pointy bits on your hips where you made the tapered cut, just sew a gentle curve there so you don't have pointy bits by your hips in the finished skirt. 12. To hem, first do a longish wide-ish zig zag along the bottom of the skirt. I prefer to do this than do a double fold hem as that can make the bottom of the skirt a bit stiff. Fold the hem up and topstitch just in from the zig-zagged edge. I like a longer stitch for topstitching. I think it looks more professional. You could also consider a heavier thread in a contrasting colour for additional interest. 13. To finish the waistband, first trim a triangle out of the second fold in the waistband folds so that when the waistband is folded over, there is a not a bit of fabric in the way. If this is unclear, I will take a photo and show you on the next one I make. Fold and pin the waistband folds in place and pull slightly so that the pieces folded next to the zip sit a couple of milimetres away from the zip so they don't get caught in it. Again top stitch this whole section in place using a longer stitch. First go down the side next to the zip, then around the bottom of the folded section then back up the other side next to the zip. Here is my finished waistband from the back. 14. And voila! You're done. I'm wearing mine with leggings, uggs and a big jumper. But that's because we're still under a few foot of snow. If you make one, please send me pics or add to my Flickr group! To take a photo, twist yourself to one side and stick one knee out - it makes you look more shapely - I learned this from watching American Top Model. genius waistband idea (probably just for me!) If you wanted A-line, you just extend out from the hips a bit more? Love your natty pose in this photos. Very 50s. Loves the skirts too. Do you remember the emerald green venetian blind top you made when you were about 13 or 14? Are you sure you have a 40" waist and 32" hips? I am not sure which fruit shape that is! 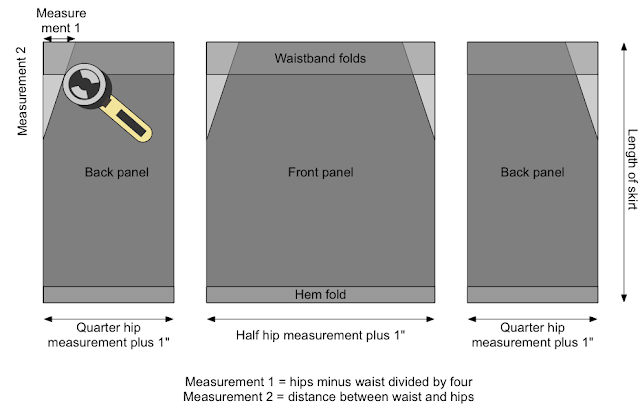 I am a bit confused by your waist and hip measurements - are they the wrong way round? Fab tutorial though. I love your stag skirt. I will try this as soon as I am not occupied with pretend tea and smooches! Great pattern Lynne ~ really like the green one! I need to try this just as soon as my waist and hip measurements don't come out at the same number. I am going to try this. As soon as I can find my tape measure. All of them have done a runner. I can't even find the steel one for measuring wood and DIY stuff. (although that would be as useful, in this instance as trying to use my quilting ruler!) Skirts look fab though. And this shape does suit me unlike many skirt tutorials which create skirts that make me look like a hobbit with a big bum. No lining! Use a rotary cutter! That sounds right up my alley. 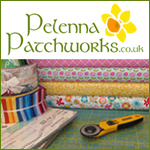 I might just see what fabrics I have lurking, just waiting to be made into a quilter's skirt and run one up. By the way, did you also learn how to do the booty toosh on America's Next Top Model? I thought I would die laughing in that episode - where they wore padded items in their knickers and then stood in a certain way to make their bums look perkier. I would really like to think Tara is sending herself up but, alas, I think she might be serious. Looks fab, well done- but i think i need some of those hold it all in knickers to make me look more "shapely" and less flabby! 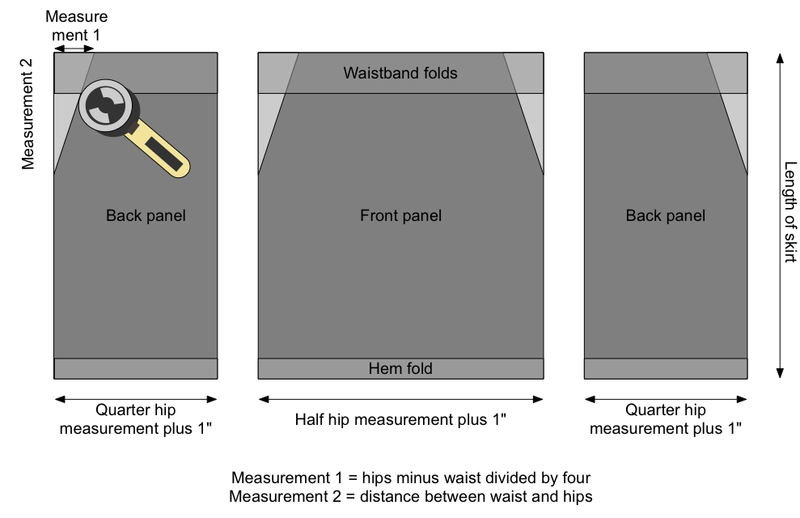 if you cut the width of the three panels based on your waist measurement... how does it fit your hips? surely you mean "hip" measurement in the caption under the diagram? Oh, good, you fixed the diagram! I did! Thank you so much for that!!! Thanks a million for this very detailed tutorial, Lynne. I usually make my skirts, but mostly from the same pattern, so it will be good to try another pattern. The skirts look great on you and thanks for the lovely tutorial. Very interesting! I've made quite a few similar skirts in the past (albeit slightly a-line which is easy to adapt from your instructions). However - I've never thought to cut it all out in one - and not have a separate waistband. I'm liking this - and will have to give it a go. 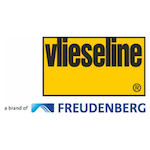 I'm wondering about ironing a piece of heavy vilene into the fold to stiffen the waistband slightly. Oh darn - I'm going to have to give it a go now :) Your skirt looks great. 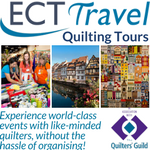 And love the "quilters skirt" title.